From meeting in a production of The Pirates of Penzance to being one of Australia’s most beloved indie acts of the noughties, Cloud Control have come in gravity-defying leaps and bounds. I remember playing their 2013 release, Dream Cave, on repeat the summer I went through my first ‘heartbreak’; instead of recalling the time as one of anxiety and angst I remember it really fondly. Those 11 tracks were the balance between happy sun-drenched psychedelic reverb and finding a kind of liberation in my melancholy. “Happy Birthday” was a song I couldn’t help but relate to because I really did hate my birthday. And ‘Scar’ was and still is a break-up song for the ages. Time has passed since 2013 and old wounds heal, so after a sizeable wait and the loss of a member, Cloud Control are back with a fresh album. I had a chat with frontman, Alister Wright to delve deeper into the making of Zone. IN: I remember reading an interview you did back in 2014, and you mentioned that it would be “another year at least” before you released new music. Obviously it’s been a bit longer, but how does it feel to be on the precipice of releasing something new into the world? Oh, it’s so good to finally be releasing something new. I feel really good. We were working that whole time on this music, we worked so hard, it’s crazy! It just took ages, so it does feel really good. I just can’t wait to start playing more shows again and we’re all really happy with how the album turned out, and it is a big release to have it finished because it just took so long. We were all going mad, so now it’s like, finally, we can just try to not be as crazy. Try to be a bit regular, a bit more of a normal person. Which is good. Yeah, it’s like moving onto that next phase of touring the material now! Yeah! When you do something for that long, it’s like “Am I totally crazy? Why am I even doing this?” It’s only 40 minutes of music. It’s insane! But yeah, that sort of feeling is now leaving, now it’s more like “Oh cool! Now to go play live!” That will be fun. So it’s mainly feelings of relief than being anxious about the reception? Yeah, I mean obviously I hope that people like it. But I feel confident in that, I really like it. I think it’s a really good album, I’m really proud of it – we all really are, and in that way I’m not really anxious. But I guess, I’m trying not to think about it too much. We have had good responses, we played in Woolongong the other day, so that felt really good. I feel like people are connecting with it already, so that’s good. I feel like all of your albums seem to have this broad conceptual theme with atmosphere and natural spaces – recording in a cave and now it’s that small beach house in Forster. How much of an impact does your environment have on the songwriting process? Yeah, quite a lot I guess! I’m really interested in that as well, you know, one of my favourite parts on, like, this Led Zeppelin tape that Dad taped off Triple M that had bits of them coughing after they had played ‘Immigrant Song’ or something, I was like “Oh that’s so cool!” You know, when you can hear the room, the place they’re in; it makes it sound real. So I mean, there’s not a truckload of that on Zone but the album was recorded in different places and you can kind of hear that stuff. It’s kind of like, I didn’t really trim that out of it, I just left it all in – the little bits of crap that make it part of the place. Which is cool. Like on ‘Panopticon’ there’s like, I was just yelling. We did a thing where we were like “OK, everything in this song is recorded in the same room," and you can kind of hear the boom sound on all the stuff. Like all of the guitar and drums and everything, and for the vocal I went upstairs and yelled it off the balcony into a mic that was really far away. And that’s that weird reverb-y kind of sound. Stuff like that is all over it. And we did it [recorded] in 5 different places. Yeah, that’s so cool when the other mics pick up the bleed through and it gives you this natural reverb. I kind of like that, it makes things sound more organic. It does sound like you went through a lot of different cobbled-together studio spaces before you found the right fit as well. What was the tipping point that resulted in the Facebook callout that you guys did? Oh yeah! Well that was when we had a place in Redfern and we had just got the notice that it was going to get turned into apartments, and we had to find somewhere new. But it wasn’t really a conscious thing to go, “Oh we have to keep moving around.” I would have loved to have stayed in just one place because it’s super annoying setting everything up again. But every time it was just like money or time or external factors that made us have to move on. Exactly! Ha! It was like, that building was fully condemned. The floor above us had no roof and there was water coming in and there was no proper lease or anything. It was real weird, we were just paying money to this random guy. Yeah, it was pretty sus. Wow, how did you end up finding the beach house in Forster? Ah that was an AirBnB place! It was a crazy idea, we had been looking for a long time to find a studio in Sydney that we could afford and could make noise in. Because that’s the thing, if you’re a bloody loud band and you want to record stuff, you need to be able to make a lot of noise! It’s so hard to find places in Sydney to do that that aren’t super expensive. So we just went, “OK Cool, think outside the box – Alright, let’s just live in Forster for a few months.” So we did that, and it was cool. It was in winter so it was pretty cheap and we just set up in the living room. Oh! 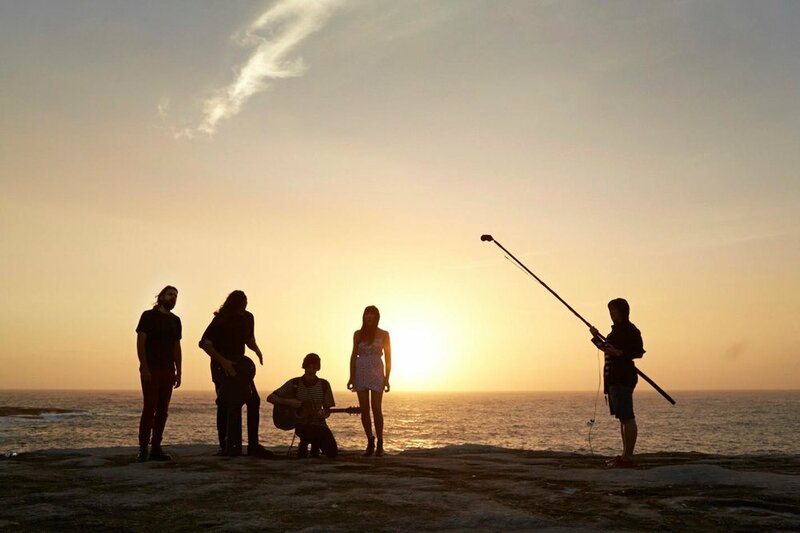 Really cool- the film clip for ‘Treetops’ is coming out and that’s like all in that area! It’s all just filmed where we were recording, it’s a pretty nice place. That’s cool. Going down that path of self-production though, it definitely seems like a really laborious choice. What prompted that decision? I guess it’s pretty freeing in a way. Speaking of gear, what was your favourite piece of equipment? Aaah! Hmm, I think. Oh man! There’s a few bits. There’s this guy, I’m not sure what his full name is, but these things are called ‘Sebatron’, right? It’s like, a dude out of Melbourne called Sebastian and he builds audio gear that’s really, really good and we recorded almost everything on the album through this one quad-preamp that just sounds real juicy. It sounds kind of tape-y and fat sounding which is perfect for us because we were going through straight into Ableton and doing everything digitally so it was like, good to get some of that nice creamy kind of stuff on everything before we even started working on it. Plus he was a great dude! We could just call him! If we had a problem, I’d go, “Hey Seb, we’ve got a problem, what should we do?” and he’d give us tips over the phone. Yeah, that was a cool bit of gear from a cool Australian dude. Yeah, cool to have a custom job in there. Yeah exactly! But having said that, dude, probably most people won’t even know what a preamp is, do you know what that is? I do know what a preamp is, yes! [laughs] But I'll add a few links in for the unenlightened. I was pretty privileged to catch your last ever show as a 4-piece. It was Southbound in 2014 or 2015? Yeah! I was there. From the outside looking in, it felt like a pretty emotional show for you guys. How have you found the transition to becoming a 3-piece? Yeah it’s been interesting. We really miss Jez, he’s a really good dude. He actually came to our last show which was really good to see him. But, I mean, you just bloody keep going. It’s been tricky. I think musically it’s been ok, as in, it’s been difficult but that wasn’t the hardest part. I think the hardest thing has been being a 3-piece and how much that changes how we relate to each other. But on the flipside, I think we grew a lot. We had to do a lot of learning to get this thing done. I think that’s why we worked on it for so long as well. It’s almost like a whole new thing… but it’s not really, it still sounds like us. But to us, it’s new. I think from the outside it’s probably not as new but to us, it’s still really new. I actually listened to Zone in full last night – I really enjoyed it – some of those synth sounds with the programmed drums create this really retro vide. I was wondering if you begin each track with a clear idea of a soundscape or it’s more something that emerges naturally? I think definitely something that emerges. With all the songs, I was really interested in (I think I have been for a long time) incorporating drum machines and synths and stuff into a band set-up and make it sound good. Not just like something that doesn’t really fit. Often we would start with a drum machine and jam over that. Like we didn’t really have a very clear vision of what songs would sound like but we ended up having some ways of doing things, ways of recording and ways or writing that would end up.. how it is now? I don’t really know how to explain it. Well I guess for some people, they just start with a click track and they play along to that. Working from there it kind of evolves. Yeah. It was all so different. Some stuff started as an acoustic demo, some stuff started with singing over a drum machine and synths. I think, yeah some things are almost the same – like ‘Zone’ the song is almost the same as how it started. All of the stuff that we recorded straight the first time is on there. But then some of them, like ‘Lights on the Chrome’, has probably 20 versions and that was the last one. But then, ‘Panopticon’ there’s like heaps of versions of that. But it was one of the really early ones that ended up being the final one. Right. There is this undeniable playfulness that I get from the album. And I have to ask what the story is behind ‘Mum’s Spaghetti’? Oh, ‘Mum’s Spaghetti’, oh yeah. I don’t know, Ulrich wrote that song in London. He made this demo and it sounded really cool and he was like, “Man, you’re going to love these lyrics, it’s like, about a burrito.” And I was like “Cool!” and then I was really, at that time, I had been watching that meme about Eminem replacing all the words with “Mom’s spaghetti”. I don’t know if you’ve seen that? The story ends in “Mom’s spaghetti”, that kind of embarrassing feeling. So it was kind of about that meme really. Even that kind of weird pitch breakdown part in the middle; that was kind of an effort to try and write that thing. I was kind of having a big story moment and just ended up with spaghetti. I think that’s something that happens a lot. For sure. And I do get a hip hop vibe in that track too with the piecemeal use of samples and electronic elements too so it works. So, I want to talk about 'Goldfish' as well because it’s got this classic-toned ball-tearer of a guitar solo… but I actually want to talk about the harmonica! Who played the harmonica? Oh yeah! Heidi did! So that was another where it was like bits and pieces. It was an acoustic demo and the demo has that exact harmonica recording. So that was just Heidi recording that at her home and we kind of built the song around it. It used to just be Heidi with an acoustic guitar and we just layered it up from that. Yeah cool. I also want to ask you about your album art. This one kind of breaks away from the theme you had going on. But how do you usually go about selecting or creating your album art? It’s always been a little bit random... actually now that I think about it, the same thing has happened each time! But I guess the first two look similar but we’ve just approached someone that we like what they’re doing. For the first album is was Kathrine Brickman and Greedy Hen and we knew they were fans of ours. And for Dream Cave it was Leif Podhajsky who was a mate of ours in London. And this time around we approached HTML Flowers, I don’t know if you know that guy? I don’t know that I do. Check out his Instagram, it’s really cool. He’s an illustrator and tattoo guy from Melbourne. He puts together really cool things. I’d been put onto him by some friends. He’s good mates with my brother and a bunch of friends. I was checking out his stuff and looking at the drawings – I don’t get affected by things that often but with a lot of his stuff there’s something kind of childish so I felt that I understood the references, it felt like we were on the same wavelength. It had a childlike quality but also really, like seen too much or something? It’s really good, check it out! So we asked him to draw something, first he drew something after listening to the album but it kind of wasn’t working out. We ended up just going with this old photocopy drawing that he did ages ago and using the plastic bag image from that on the front cover. Mmm, I’ve got a couple more questions before we wrap up. What was the most memorable show you’ve played? You guys have toured a fair bit now. Um, yeah. I should try to think of a good answer because some people ask me this but I don’t really know. At the moment, to be honest, I’m still thinking about the Wollongong one, that was really, really fun. It’s usually just the last show that we played. So that Wollongong one was really good but before that, the Melbourne and Sydney shows that we just did, they felt really good. It’s been such a long time that I can only really remember the recent ones. Sometimes when we’re playing it feels as though I’m almost blacking out. It just happens and then the shows over and it’s like “Woah, back to reality," like Eminem. Haha it’s like a fugue state. Yeah, I don’t know. Say that Falls one, that was so long ago! We’ve done so many shows since then, well not heaps but still at least 20. I also saw you guys down in Yallingup when you did that tour with Carona at Caves House. That was a cool little show. Oh yeah! Man, see, that tour is especially blurry. There was a day where we did 4 shows, there was like 2 or 3 shows every day. You know that tour, playing acoustically like that, I felt like I learnt something, when we were quiet. I mean, you always think that you have to rock out and be loud as a band to get things going but, all those shows were insane! Like people crowd surfing and doing all this crazy stuff that you get at a bigger show but I felt like we were really quiet. I guess because it was quieter, there was room for the crowd to be part of it more. And I guess, especially with those venues as well. Because they’re smaller and a bit of the beaten track. Totally! And I didn’t really know what to expect but people got so behind it. I was pretty blown away. I would be pretty pumped to do something else like that again, some kind of acoustic tour in the future. Mmmm, interesting. Interesting. Final question, do you have any advice for any would-be bedroom producers? Ah, well. I’m not 100% sure how it works these days but I would say get out! Don’t be too precious. Just get out there, put your tracks on the internet. Get out there and go play some shows. You need to do both right? You need to keep honing your craft, but as someone who does this a lot, I think you need to literally press ‘Export’ and get out there, do some stuff and learn from doing it and being around people. I guess you can become a bit obsessive when you’ve got a track sitting there in front of you, making sure everything is perfect. Well it’s been awesome chatting with you. Sweet, nice one. Thanks a lot. 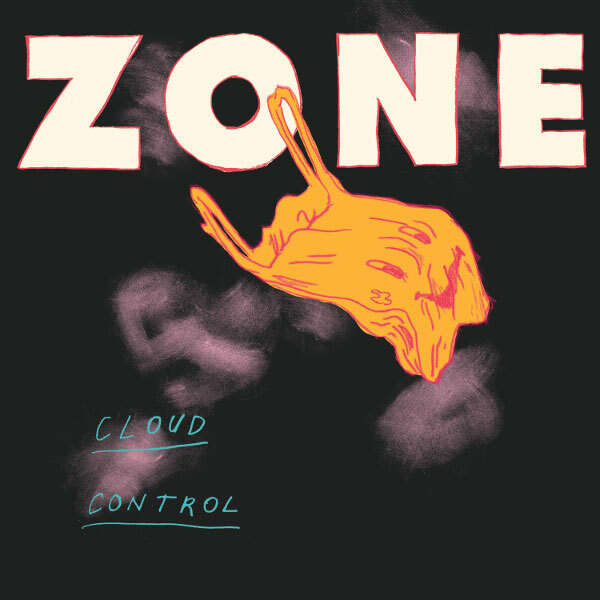 Zone is out Friday the 1st of September or you can catch it live when Cloud Control play Badlands Bar on Sunday the 1st of October.